What is 254 SMO Pipe Fittings ? Aakash Steel is Renowned & one of the oldest manufacturers, stockist & suppliers of 254 SMO Pipe Fittings have special quality finishing and duress for long life, high pressure and zero defects. All 254 SMO Pipe Fittings are offered with a NACE 3.1 Certification, Mill Test Certification and ISO 17025 Standards by a Government of India approved Laboratory. Positive Material Identification is done on all raw material procured at Aakash Steel.We are one of the few manufacturers in India who can weld, bend and form 254 SMO Pipe Fittings in various sizes and dimensions. Orders at Aakash Steel are guaranteed fast delivery of the 254 SMO Pipe Fittings in the country. The main reason being we have an excellent warehousing and storage facilities for both finished and semi finished goods.They are made ready as per the urgent requirements of the customers. The 254 SMO Pipe Fittings are manufactured to sustain very high pressure and product warranty.In 2016 we have stocked 15 tons of 254 SMO Pipe Fittings in all sizes, to cater to immediate delivery and urgent needs of the clients. For small requirements we can dispatch the 254 SMO Pipe Fittings immediately against the purchase order. Aakash Steel is one of the best vendors of 254 SMO Pipe Fittings. 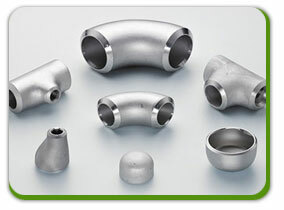 We are the market leaders in manufacturing and supplying superb quality 254 SMO Pipe Fittings. Our products are well known for their excellent strength, brilliant quality and extended lifespan. We offer fittings in all shapes, sizes and specifications provided by the customers. We also export products worldwide and have delivered products in more than 30 countries. Our diversified experience includes servicing major sectors such as oil and gas industry, marine industry, chemical industry and nuclear industry among others. Alloys 254 / 254 SMO / 6 Mo is an austenitic stainless steel with a high molybdenum content. Coupled with Nickel and Copper this gives the alloy a good resistance to pitting and crevice corrosion, especially in environments containing halide ions, e.g. chloride, bromide and fluoride solutions.254 SMO (UNS S31254) may offer a cost effective solution to Nickel and Titanium alloys in these environments. We can manufacture and offer high quality 254 SMO pipe bends with bending radius ranging from R=3D-10D and bending angle of 10 degree to 180 degree. In addition, we can also manufacture 254 SMO bends as per custom requirements of our esteemed clients. All our 254 SMO fitting and flange products are supplied with relevant test certificates of raw materials and finished products. 254 SMO pipe bends with a bending radius 3D, 5D and 7D are most commonly used across various industries. Our key pipe bend products include – high quality 254 SMO long radius piggable bends, seamless long radius piggable bends and welded long radius piggable bends. Each order is packaged according to the customer’ s standards including preparation for export such as wooden case, pallet or according to customer’s requirement All shipping documentation is provided for 254 SMO Pipe Fittings delivery from mill to customer. All 254 SMO Pipe Fittings are 100% inspected to from the starting point to maintain a good quality.Packing of 254 SMO Pipe Fittings are packed our all material in wooden box wraps with foam paper as well as plastic, newspaper ,Plastic bubble wrap according to need of customer need.